Microsoft today introduced the new Surface Pro, choosing that name over Surface Pro 5, at a media event in Shanghai, China. Microsoft said the new Surface Pro delivers up to 13.5 hours of battery life on a single charge, a 50 percent increase over the Surface Pro 4 and 35 percent more battery life than the iPad Pro's advertised 10 hours. The notebook-tablet hybrid features Intel's latest Kaby Lake processors, including Core m3, i5, and i7 chips depending on the model. Microsoft says the high-end Surface Pro with a Core i7 processor is 2.5× faster than the Surface Pro 3 and 1.7× faster than the iPad Pro with Apple's own A9X chip. Surface Pro m3 and i5 models feature a new fanless cooling system, while the i7 model still has a fan with "improved hybrid cooling." The new Surface Pro has a refined design with cleaner lines and curved edges, a "visually softer" camera, and an improved hinge with a 165º range of motion allows it to be placed in Studio Mode like its Surface Studio desktop. It's also the lightest Surface Pro ever, starting at 1.7 lbs. By comparison, the 9.7-inch and 12.9-inch iPad Pro weigh 0.96 lbs and 1.57 lbs respectively. The new Surface Pro continues to have a 12.3-inch display with 267 pixels per inch, compared to 264 PPI for both the 9.7-inch and 12.9-inch iPad Pro. Microsoft says its custom PixelSense technology means that colors on the new Surface Pro will be "more vibrant, precise, and impactful than ever before." Other tech specs include up to a 1TB SSD, up to 16GB RAM, up to Intel Iris Plus 640 graphics, a USB 3.0 port, a microSD card reader, Mini DisplayPort, and a 3.5mm headphone jack. The device runs Windows 10 Pro. 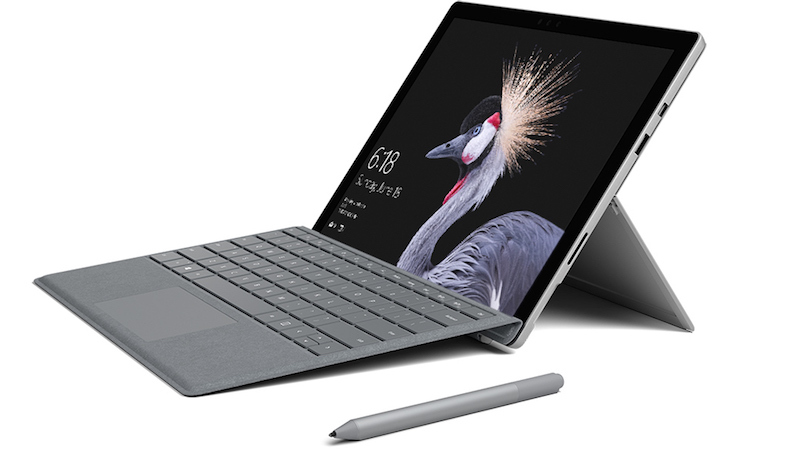 The new Surface Pro is accompanied by a new Surface Pen with over 4096 pressure points, only 21 milliseconds of latency, and new tilt functionality. Microsoft says the new Surface Pen is over two times more accurate, with four times more pressure sensitivity, than the original Surface Pen. There's also new Signature Type Covers, now designed with Alcantara fabric for a "soft, velvety" feel. Microsoft pitches typing on the keyboards as "easier, more, comfortable, more accurate, better sounding, and easier to do without looking" than the 12-inch MacBook and iPad Pro. The new Surface Pro and Type Covers are available to pre-order today in the United States and select other markets at the Microsoft Store, Microsoft.com, BestBuy.com, and JD.com. The new Surface Pro will ship on June 15 in 25 countries. Surface Pro pricing starts at $799.99 in the United States. Surface Pro models with LTE Advanced will be available later this year. The new Surface Pen will be available in the coming weeks. Does it still run Windows? Yeah? I miss Microsoft's incompetence under Ballmer. An Intel Core i7 which requires a fan to keep cool is only 1.7x faster than a 2 year old A9X ARM CPU? Doesn't sound too impressive. Lol at the people on here belittling how the Surface is faster than the iPad pro because the iPad runs an ARM processor. I don't care what the iPad runs, they cost roughly the same yet the Surface can do more, much much more than the iPad Pro. The ARM processor may be amazing, but let's face it, as Jamesrick posted before, it's crippled by the limitations of running iOS. I'm not tempted by this for the sole reason that it has Windows on it. But what Microsoft is doing right is not just slapping a phone OS onto a tablet and expecting us to fall for it. Are you paying attention Apple? They just compared an i series CPU with an ARM CPU, i think incompetence is alive and well. Win 10 has been a pretty good experience so far, for me. Wow, the core i7 laptop grade processor is faster than an in house processor designed specifically for a tablet with a touch interface? You don't say!